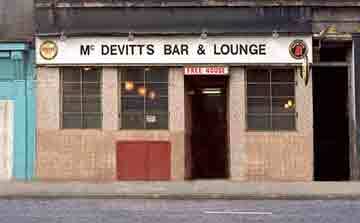 McDevitt's Bar 15-17 Norfolk Street. There has been licensed premises on this site since 1877. The first licensee was wine & spirit merchant David Ballantyne. Mr Ballantyne also had pubs at 151 Hospital Street, 75 Caledonia Road, 62 Nelson Street, Tradeston. David lived with his family at an exclusive address 45 Abbotsford Place. Mr David Ballantyne contained in this pub until 1888. Another well-known and respectable member of the Scottish Licensed Trade to own this pub was William Craig. Mr Craig was already an established liquor merchant in Glasgow having premises at 52-54 West Street, Tradeston at the corner of Nelson Street; he also operated a licensed grocer’s shop on Pollok Street formerly owned by Thomas Bennett. In 1889 he took over the pub at 15-17 Norfolk Street near to Gorbals Cross, at that time there were twelve pubs trading on Norfolk Street. 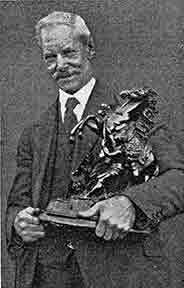 William Craig came to Glasgow from Inchinan, Renfrew where he was born. In 1881 he was living at Craigmiller, Nithsdale Road with his wife Janet and had a large family of three sons and three daughters. Also living with them was his father-in-law Robert Miller a retired Mercantile Clerk, along with his wife’s aunt Susan. Mr Craig was making enough money in the licensed trade and could afford two domestic servants. When the Mr and Mrs Craig took over a beautiful villa in Nithsdale Road they named it Craigmiller after their surnames. When the family moved to St John's Road, Pollokshields they renamed this villa "Craigmiller". Mr Craig was born in Kirkfield Burn, Lanark and came to Glasgow in 1881. His father William and family all worked as carpet weavers. When William came to Glasgow he worked for a short time in the railway, but gave this up to work with his uncle, Samuel Aitken, a wine & spirit merchant in both Duke Street and North Woodside Road. Samuel also came from Kirkfield, Lanark, he lived in Greenock for a short spell before coming to Glasgow to set up a home in North Woodside Road, with his wife Elizabeth and a large family of five sons. In 1877 he acquired the licence for premises at 262 North Woodside Road near to he residence. William Craig joined his uncle in the Duke Street premises and was soon managing the premises. On the death of his uncle, William became the new proprietor for Duke Street. In 1898 William was the new landlord on the Arcade Bar, West Russell Street at the entrance of the Queen's Arcade. The Duke Street premises were lost as a result of Dennistoun Ward Voting Limitations in 1920. William concentrated his efforts into one licence. He was a member of both the St. Rollox and Uddingston Bowling Clubs, this took up most of his spare time when he wasn't serving his customers behind the bar. William recalled the old days when children of tender years used to come for father's refreshments and the heavy duty on whisky was from 10/6 to 72/6 per proof gallon. Rrestrictions that were imposed after the war dealt a crippling blow to the trade. Even before that the writing appeared on the wall when opening hours were cut down from 8am to 11 pm to 10 to 10 each day, these changes were welcomed by some and deplored by others. At the same time they were privileged people when it was remembered how the permitted hours were restricted during the war and how they were curtailed to 8 per day by the 1921 Act. At the end of the 1890s William Craig was elected President of the Scottish Wine and Spirit Merchants Benevolent Institution. The grocers business was demolished many years age, West Street was demolished in the 1960s, Norfolk Street followed in the 70s, then owned by Michael Joseph Heraghty the well-known Garry Owen Bar, the Southern Bar was the last to survive and was demolished shortly afterwards. In 1899 William Craig was licensee of 15-17 Norfolk Street, many will remember this old pub as the Garry Owen, 52-54 West Street, 27 West Russell Street and off license at 36 Pollok Street. In later years he owned a pub at 217 Duke Street. Left to right Mr Reid (United Caledonian Breweries Ltd); Mrs Reid; Mr Peter Smith (The Crookit Bawbee); Mr Michael J Heraghty; Mrs P Smith; Mr H Scoffin (Old Smuggler); Mrs N Derbyshire (the Anderson Bar, Ardrossan). 1963. Left to right back row: Mr J Thom; M J Heraghty; N Douglass; Charles Sweeney; James K Webster. Front row: P McGovern; Hugh Gallagher (Convener); Sam Falconer (Secretary); Raymond McCrudden (Vice Convener). 1965. 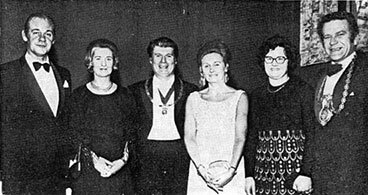 This image was taken at the Gala Night for the Gorbals Ward in 1965 at the Grosvenor. It was one of the most successful Halloween dances ever held by the Gorbals Ward Licensed Trade Association. 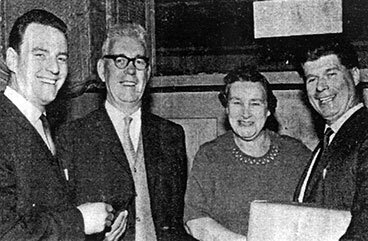 Left to right Sam Falconer, Mr & Mrs James K Webster and Michael J Heraghty 1968. This image was taken at the retirement of James K Webster, with his premises Webster's Bar being taken over for redevelopment by the City Council. Mr Webster decided that the time was opportune for him to retire from the trade. 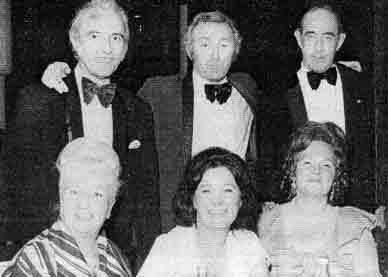 Annual dinner dance for the Gorbals Ward held in the Bellahouston Hotel, Glasgow 1971. Many well known and respected members of the Gorbals are in this image can you name any of the men and women. Left to right Mr L Brady (Brady & Co.); Mrs Brady; Mr Michael J Heraghty (Convener); Mrs G Grier; Mrs Heraghty; Mr George Grier (President) of the Licensed Trade Association. 1972. This image was taken in the Garry-Owen when Mr & Mrs Michael J Heraghty entertained friends and colleagues as a farewell gesture, included in the image are L Brady (Brady & Co.); D A MacLean (Phoenix); Hugh Gallagher (Gallagher's Bar); J McKell (Turf Bar); Sam Falconer (The Matelot); E O'Doherty (Hampden Bar); P McGovern (Central Bar); and J McCann (Mally Arms). 1972. Due to the redevelopment of the Gorbals Michael J Heraghty had to give up the Garry-Owen Bar in Norfolk Street. He still has the Heraghty Inn in Oxford Street. Left to Right: R T Grier (Sen Vice President); Mrs Grier; Mr William D B Wishart; Mr M J Heraghty; Mrs Heraghty; Mr J B McCann (secretary); Mrs McCann. 1974. Included in this image of the Gorbals Ward in 1974 at the Beechwood restaurant, Glasgow are: Mrs M Millarky; Charles Sweeney; M J Heraghty; Mrs Heraghty; G Watt (Bells); E O'Doherty; Mrs O'Doherty; Hugh Gallagher; Mrs Gallagher; J Donaghey; Mrs Donaghey.